Christopher Lasch has examined the role of women and the family in Western society throughout his career as a writer, thinker, and historian. 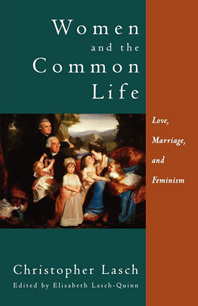 In Women and the Common Life, Lasch suggests controversial linkages between the history of women and the course of European and American history more generally. He sees fundamental changes in intimacy, domestic ideals, and sexual politics taking place as a result of industrialization and the triumph of the market. Questioning a static image of patriarchy, Women and the Common Life insists on a feminist vision rooted in the best possibilities of a democratic common life. In her introduction to the work, Elisabeth Lasch-Quinn offers an original interpretation of the interconnections between these provocative writings.